Lemon laws do not protect the consumer from purchasing unripe lemons, but perhaps they should. When you cut open one of these citrus fruits, you probably expect firm flesh and lots of juice. So anything less spells culinary heartbreak. If you have your own lemon tree (Citrus limon spp. ), you can forestall disappointment by learning the secrets of picking ripe fruit. Ripeness cannot be judged by color alone. 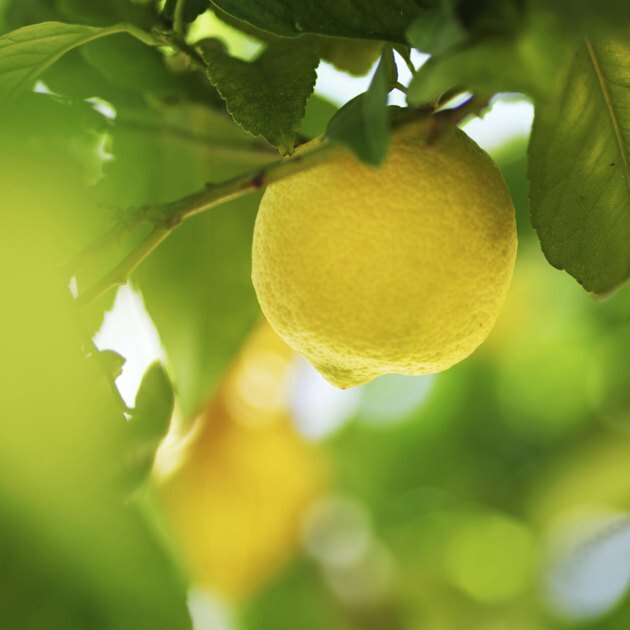 A lemon tree in your backyard orchard ensures a ready supply of the juicy citrus. Various cultivars of lemon trees are hardy in U.S. Department of Agriculture plant hardiness zones 9 through 10. Some of those cultivars, including "Eureka" (Citrus limon "Eureka"), fill the tree with bright fruits almost year round. Fruits are not ripe until the color develops, but just because a lemon is a particular shade of yellow does not mean it is ripe. If you pluck some other kinds of fruits from their trees before those fruits are ripe, it takes only a little patience until they ripen. The same maneuver with a lemon will buy you disappointment. Lemons ripen on the tree or not at all. So getting your harvest timing right is critical. Ripe lemons are a brilliant shade of yellow or yellow-orange and have a shine to their skin. Wrinkled or dull skin means that you waited too long; the fruits are past their prime. All the eyeballing in the world is not sufficient to identify a ripe lemon, however. You're better off taste-testing one fruit to judge the ripeness of the rest of the tree's lemons. Know what fruit you taste, though. Cultivars such as "Eureka" and "Lisbon" (Citrus limon "Lisbon") offer tart, juicy fruits at harvest time while the lemons of the cultivar "Meyer," also called improved Meyer (Citrus meyeri and Citrus limon "Meyer Improved"), are milder and sweeter. When your tree's lemons ripen, you may have more on your hands than you can possibly use. The best choice for storing the fruits is on the tree, according to the University of California Cooperative Extension in Sacramento County. Hard freezes, however, damage lemons. So pick all the ripe fruits if a bad weather system is expected. Ripe fruits store well in a plastic bag in a refrigerator for one or two weeks, depending on the variety. "Meyer" lemons do not last as long as tarter lemons. An alternative to storing lemons in a refrigerator is to juice the fruits and keep the juice in your freezer for future use. When Should I Pick Oranges Off the Tree?